The Cakemaker, Ofir Raul Graizer’s debut feature, is a sensual, nuanced film, a look at love and loneliness, the external definitions and borders that define identity and separate people, and the urge to transcend those limits. The carefully structured narrative flows from Berlin to Jerusalem, in a film that prefers to show rather than tell, conveying the feel of these very different places and the lives that are possible, or not possible, to live there. Those who prefer to avoid spoilers, must stop here, because any further discussion of The Cakemaker inevitably reveals crucial aspects of the narrative. Eschewing the explicit and the sensational, Graizer explores the complexities of attachment and feelings. Oren (Roy Miller) is an Israeli who travels frequently to Berlin on business. There he develops a relationship with Thomas (Tim Kalkhof), a young baker, from whom he also buys cinnamon cookies to bring home to his wife Anat (Sarah Adler). This is established in a few initial scenes, set in Berlin, and nothing that happens from that point on is at all like one might expect. Oren dies unexpectedly, tragically, in an accident. He remains somewhat of an enigma, and as the film unfolds one learns more about him through the other characters. There is a strong sense of the freedom to reinvent oneself that can be experienced when traveling far from home and family. Away from the structures and norms in which one was raised, the expectations of others, it is possible to experiment, to discover all those hidden aspects of the self. This theme is relevant to Oren, yet within the film it is developed through Oren’s lover, Thomas. Rarely given to verbal expressions, one comes to know Thomas through his actions, and the camera’s warm gaze. 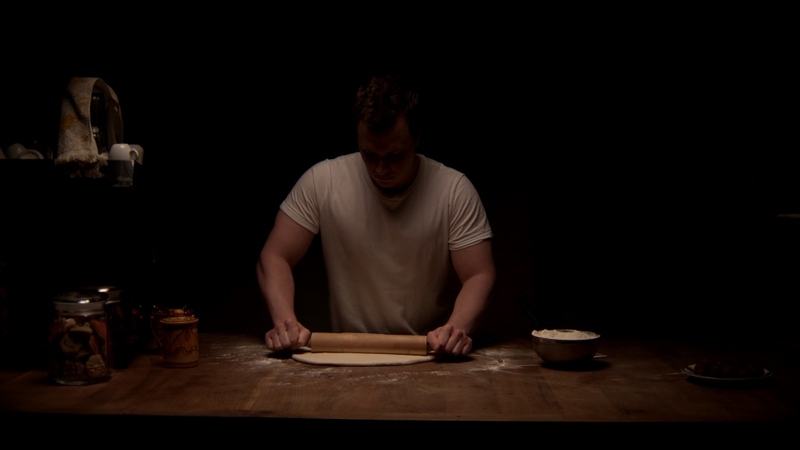 The image of Thomas’s hands kneading dough, that tender, sensitive, touch almost says it all. After he learns of Oren’s death, Thomas comes to Jerusalem, to the café owned by Anat. It is an unlikely encounter between two people, who in other circumstances, would never meet. In Jerusalem, Thomas is an outsider, with all the loneliness and possibilities that implies. He comes to the café and asks Anat for a job, an infiltration of her life that seems almost sinister, knowing the secret he harbors. Anat, newly widowed and trying to cope with running the café while raising her son on her own, ultimately takes Thomas on. Sarah Adler brings a luminous quality and emotional depth to her performance as Anat, revealing the many layers and internal conflicts and contradictions. The external conflicts are numerous as well. Her son Itay has just lost his father, her business is not doing so well, and while the help of her family is not only welcome but necessary, this kind of help tends to come with a need to manage and control. Moti (Zohar Strauss), Anat’s religious brother-in-law, is always there to help, yet just as insistent that they comply with his world view. The description of family life, with its warmth, support and occasional claustrophobia, is very vivid and precise. As the outsider, Thomas brings something new into this scene, in more ways than one, and he receives much from them as well. Sustenance, pleasure, and the sense of community are themes explored through the interactions of the characters around food. From the cinnamon cookies that Oren used to bring to Anat, to Thomas’s creativity in the Jerusalem café and the hubbub it arouses regarding the laws of Kashrut, to family meals, food in this film is at once symbolic and essential, an element that brings people together, and distances them from one another as well. When Thomas is invited to a family Friday night dinner, he meets Hanna (Sandra Sadeh), Oren’s mother. Unlike Moti, she simply accepts Thomas, with warmth, and without too many questions. Here too, as in much of the film, the power of what remains unsaid is deeply felt.